We depend upon nature to provide us with flotsam for the materials from which we craft our furniture. That boat docks and piers decay and suffer the ravages of weather is a given. What’s also inevitable with the sea and those who ply it is tragedy. 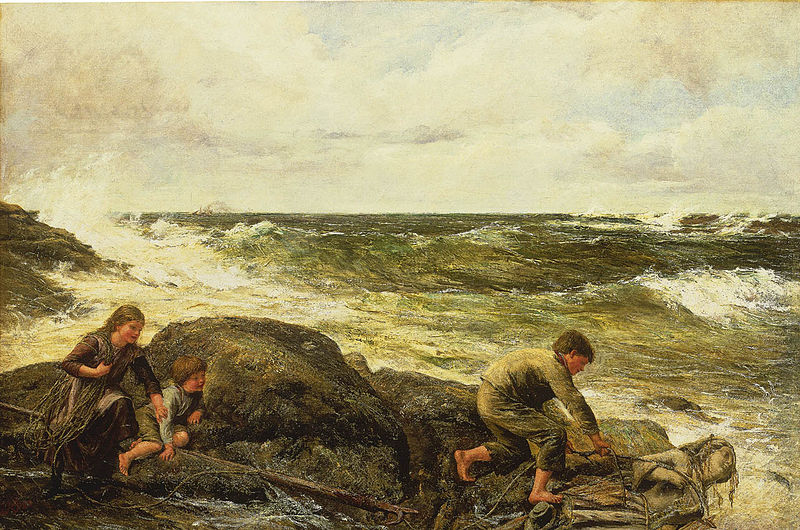 When the British artist James Clarke Hook painted “Catching a Mermaid” in 1883, who knows what thoughts he imagined in the minds of the siblings he shows trying to salvage the figurehead of a wrecked or sunken ship . . . flotsam! It’s clear that the older boy is determined to bring their “mermaid” ashore, and that his sister is holding back the youngest boy. But have they any sense of the horror signified by the figurehead’s presence on that rocky shore, looking so like a drowned woman? The innocence of youth may protect them, but for viewers of the painting the implication had to be clear: shipwrecks and resulting loss of life were all too common in those days. The painting’s title is all too ironic. Note: For the definition of “flotsam,” please see our post of November 16, 2013.